Aptly named, The Repeat Retreat is a vacation rental haven that vacationers will want to return to again and again. Situated perfectly in the Corolla Light Subdivision, this home offers many attributes that will make you eager to come back for more. From the private pool and spacious decks to the incredible locale within the #1 Rated Resort in North Carolina for six years running, the Repeat Retreat provides a vacation experience that’s definitely worth repeating. Vacationers will enjoy a suite of community amenities that are offered by the prestigious Corolla Light Resort, such as four lifeguarded pools, (including two oceanfront pools and baby pool, a sound side pool with baby pool, and a Junior-Olympic Sized indoor pool), racquetball courts, indoor and outdoor tennis courts, lighted volleyball courts, and a children’s playground. Take a stroll to the sound front pier and gazebo or reach the beach via the trolley that connects to five lighted oceanfront walkways and gazebos. If you can tear yourself away from everything Corolla Light Resort has to offer, you’ll find plenty of outdoor amenities at home as well, such as a sparkling private pool that’s bordered by a privacy fence and is found in a pristine natural setting, a bubbly hot tub, and an outside shower and gas grill. Step inside and enjoy a little family fun in the rec room with TV/VCR, Queen Sleeper Sofa, pool table, and wet bar with full-size refrigerator and microwave. Vacationers will also be just steps away from a convenient half bath, access to the pool and hot tub, as well as a King Master Bedroom with TV/VCR. Head upstairs to unwind after a full day of community fun in one of the four bedrooms that are found within the peaceful second level. There’s a King Master Bedroom with TV/VCR, a Queen Master Bedroom with TV/VCR, a Bedroom with Double Bed and TV/VCR, and a Bedroom with a Bunk Set and TV/VCR that shares a full bath with a relaxing sitting room with Queen Sleeper Sofa and TV/VCR. Surrounded by covered decks, vacationers will always be steps away from those cool sea breezes. After a full day at the golf course or the community fitness center, families can reconnect in the ample great room which features a cozy but spacious living area with TV/VCR, stereo with CD, gas fireplace, plush furnishings, and plenty of natural light. The kitchen is nearby with casual breakfast bar seating, as well as the grand dining area with seating for 10. There’s also a King Master Bedroom that’s fit for royalty on this level, which boasts a TV/VCR/DVD and a dreamy whirlpool tub. Inside and out, The Repeat Retreat offers a veritable world of entertainment for vacationers of all tastes and ages. 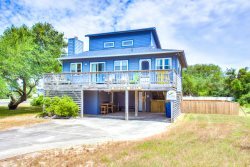 From the community trolley to the beach to the incredible nature trails that are just around the corner, this elegant retreat promises miles of fun during your next vacation, and every OBX vacation in the years to come. Top-Level: Great room with TV/VCR, stereo with CD, gas fireplace, half bath, kitchen with breakfast bar seating 2, dining room seating 10, King Master Bedroom with TV/VCR/DVD and whirlpool tub. Mid-Level: King Master Bedroom with TV/VCR, Queen Master Bedroom with TV/VCR, Bedroom with Double Bed and TV/VCR and a Bedroom with a Bunk Set and TV/VCR that shares a full bath with a sitting room with Queen Sleep Sofa and TV/VCR. Laundry with washer and dryer. Ground-Level: Outside amenities include a private pool, hot tub, outside shower, and a gas grill. Inside you’ll find a rec room with TV/VCR, Queen Sleep Sofa, pool table and wet bar with full-size refrigerator and microwave, King Master Bedroom with TV/VCR, half bath and access to the pool and hot tub.